Since some of our successes with other dairy products I thought we would try our luck at making some basic cheeses. For me the idea of Farmer’s cheese is exciting. It drums up images of felt-hatted European dairymen collecting the morning milk, adding some farm made yoghurt and rennet made from nettles or more gruesomely, calves stomach and making a fresh batch of cheese to have on their morning bread. This is probably a little more imaginative than reality but I thought that Farmer’s cheese would be a nice place to start. 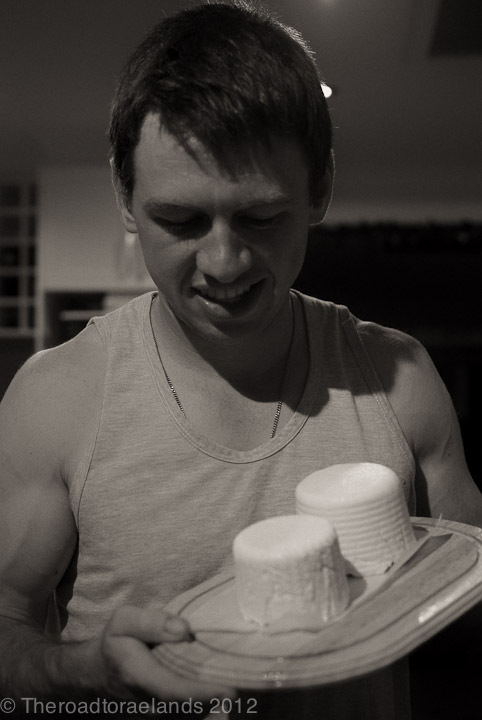 The cheese itself is an unripened cheese made using a bacterial starter (in this case home-made yoghurt) and rennet. The cheese is pressed in cheese baskets for 4 hours under about 1kg (2lbs) of weight creating a soft textured not unlike Mozzarella and Halloumi in taste and feel (It has a similar ‘squeeky’ feel to it). We used 3.8L (1Gal) of fresh milk from the farm, which I ended up pasteurizing in our double boiler (I wanted to try pasteurizing so I used the fast method of heating the milk to 72°C (161°F) and holding for 15 secs prior to placing the milk pan in ice water to rapidly cool to 4°C (40°F). You can also heat the milk to 63°C (143°F) however you must hold it at or slightly above this temp for 30mins). You will also need 1 cup of plain yoghurt, which is the culture, 1/4 tsp of liquid rennet dissolved in 1/4 cup of unchlorinated 15°C (60°F) water, which allows the enzyme rennin to work its magic (separates the curds from the whey), 1-2 tsp of Cheese salt/De-iodized salt, enough Butter Muslin to line a colander and two molds and some string to hang the butter muslin up. Heating can be tedious in a double boiler. However the even distribution of heat reduces the risk of scalding the milk. 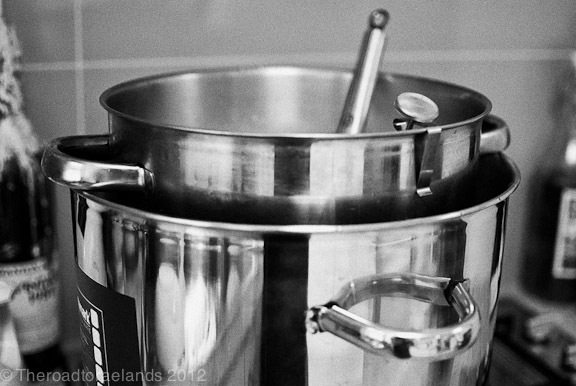 I suggest that before you start try and have everything sterilized, clean and cooled to the correct temp. I didn’t do this well and it was stressful having to cool pasteurized milk with minimal ice. It was also kind of annoying having to wait for the rennet water to cool. If you are pasteurizing your milk it will take about 45mins-1hr to heat your milk in a double boiler. It will also take some time to cool. The first step in making Farmer’s cheese is to combine the yoghurt and milk in a larger heavy based pot or double boiler and heat to 35°C (95°F). Next, combine the rennet and cool water and slowly splash the mixture onto your slotted spoon and into the milk, stir gently for 30secs. Remove from the heat and let sit until the curds produce a ‘clean break’ (usually within 30-45 mins). A clean break is when you can insert a sterilized thermometer or very clean finger into the curds and gently lifting, snap the curds. You are ready to take the next step when a neat crack (see photo) occurs. Cut the curds into 25cm (1 Inch) pieces with a long blunt-ended knife/curd knife. 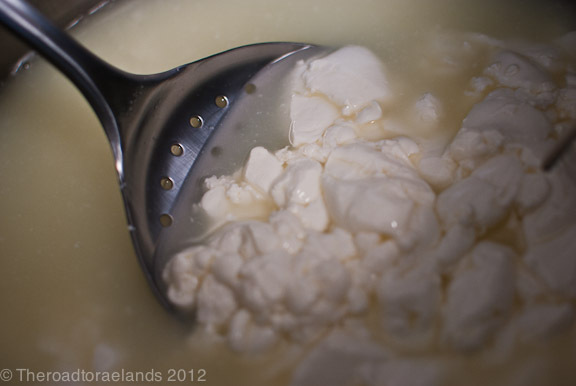 Heat the curds and whey to 50°C (120°F) gently stirring the curds from bottom to the top (stir for 5 mins). Stir every 5 mins until 50°C is reached. Transfer the curds into a colander lined with Butter Muslin. 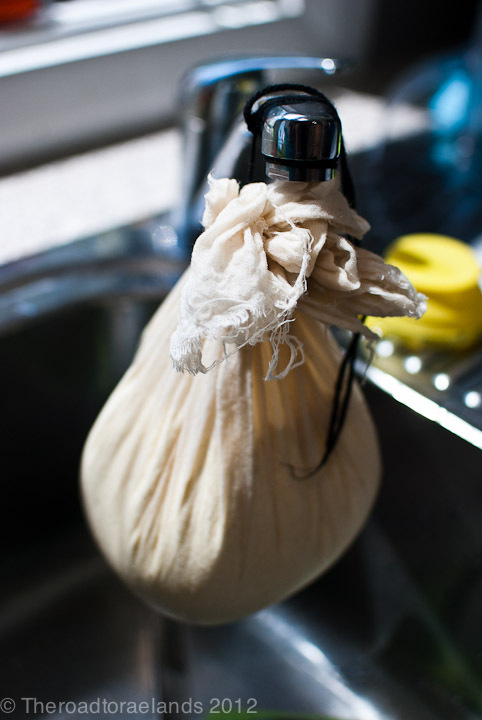 Tie the butter muslin and hang drain for 1 hr (see photo). Transfer the cheese to a bowl and add the salt, gently crumbling it through. Line two cheese molds with butter muslin, add the cheese, cover the tops with the excess butter muslin and press in the fridge under a 1kg (2lbs) weight (I used a small ceramic ramikin to press down onto the cheese and a larger ceramic bowl on top to equal the 1kg). Press for 4 hrs. This entry was posted in Cheese making and tagged Agriculture, Cheese, Cheese making, cows milk, Farmers cheese, home made, Pasteurizing, Raelands, raw milk, self sufficiency. Awesome! I’m going to give this one a shot. I’ve made mozzarella with some success, but I think this will work out better for me. Thanks, so far your blog looks awesome!